Unique panorama of the city. 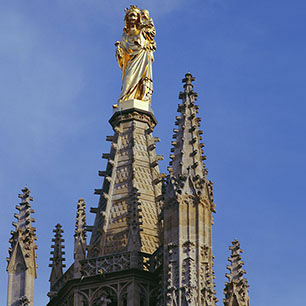 Situated to the south-east of the chevet of the Cathedral of Saint-André at Bordeaux, the tower of Pey-Berland serves as its bell tower, built in the 15th century in the Gothic style. Its isolation was due to the wish to provide the Cathedral with magnificent bells which would not threaten the structure with their vibrations. Designated world heritage site by UNESCO.